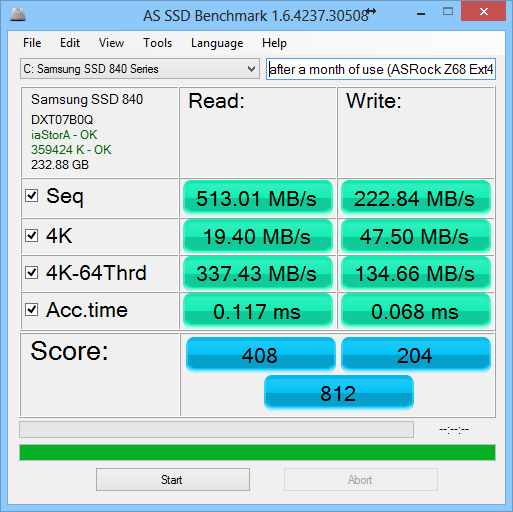 Remember that I bought a Samsung 840 series 250GB SSD about a month ago? Remember also that I told you I would be closely monitoring the degradation? This is the report after a month of moderate use. 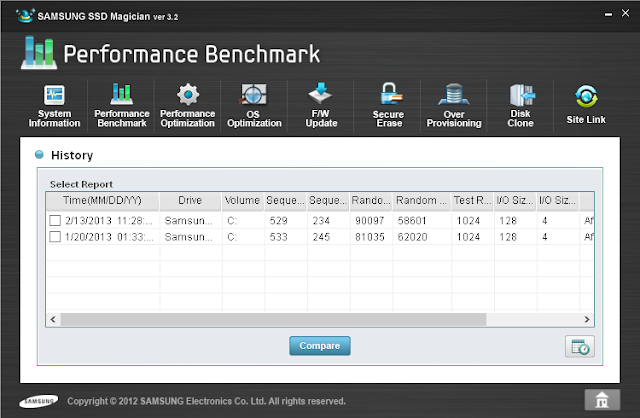 On a fresh Windows 8 Pro x64 installation, the Windows Experience Index rated the SSD at a score of 8.1. But over the past month, I installed a lot of applications and huge games and now the SSD is 30% full. (Yeah, just 30%!) Once even I mistakenly copied my entire iTunes music collection to the SSD. Then I downloaded a whole 10GB file to the SSD without knowing that it was being downloaded into the SSD. I also did not do any of the space-saving tricks discussed here either. I'm using the default temporary folders. However, I do not let those temporary folders to fill up. Everyday at 10PM, a scheduled CCleaner cleanup job gets executed and all the temporary files get purged. The Windows Experience Index score for the SSD quickly dropped to 7.9 after a couple of weeks. I wasn't happy about it because that's what I got with my old SSD as well. I waited a week or so hoping that the original performance would be automatically restored, but it didn't happen. I felt as if I was cheated. 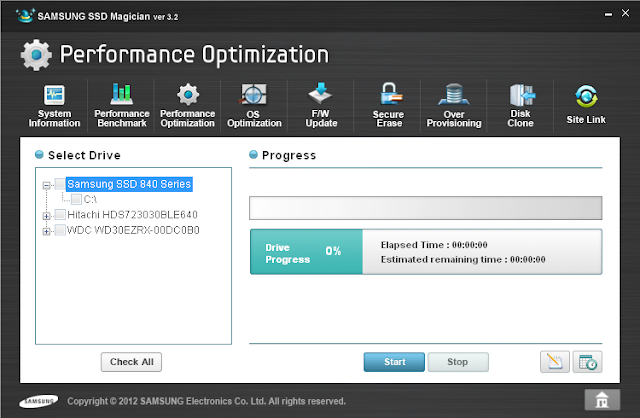 The SSD comes with a maintenance / management tool called the Samsung SSD Magician. You can perform various tasks in it. I'm not actually sure what Performance Optimization does, perhaps some sort of garbage collection, but that is what we are interested in. Last night I ran it to see if I can get back the score of 8.1 in Windows Experience Index. It didn't take long. It originally predicted a running time of 6 minutes, but it actually finished within a minute. Thus I wasn't expecting any miracles. But that's what I got. A miracle. I reran Windows Experience Index assessment and I got back 8.1. w00t. Too bad I couldn't run CrystalDiskMark or ATTO when the score was at 7.9. But here's the score after optimizing. There is definitely some degradation, but it is not that much. As long as it keeps above that 800 mark, I would be happy.